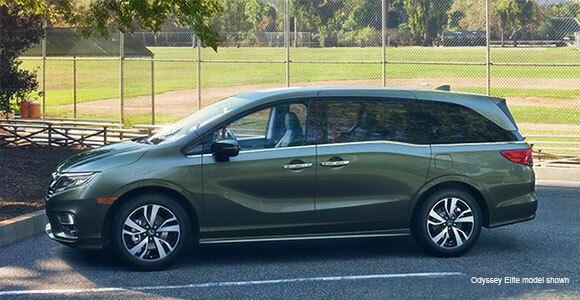 The all-new 2018 Honda Odyssey gives carpooling families more imaginative solutions than ever. Available CabinWatch technology utilizes a ceiling camera and night-vision technology, so you can keep track of your kids in the rear seats at any time of day. And, if you sign up now, you can select the “allow a dealer to contact me” option and become one of the first to know when the 2018 Odyssey goes on sale. *Stk#72F5074. 36 month closed end lease. 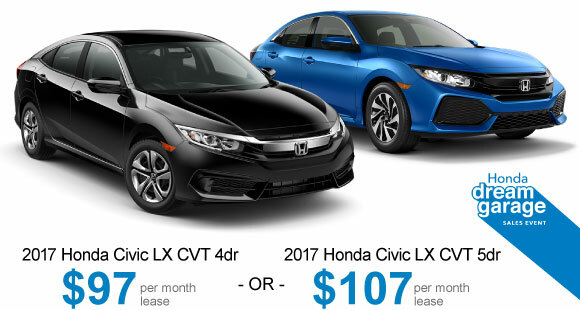 2017 Civic Sedan LX CVT: MSRP $20,375 – FC2F5HEW, $3499 trade or cash down. First payment, $595 acquisition fee, taxes and DMV fees due at signing.12,000 miles/year. $0.15 overage. To qualified buyers through AHFC. Offer valid through 5/1/2017. **36 month closed end lease. 2017 Civic 5door LX CVT: MSRP $21,335 – FK7H2HEW, $3499 trade or cash down. First payment, $595 acquisition fee, taxes and DMV fees due at signing.12,000 miles/year. $0.15 overage. To qualified buyers through AHFC. Offer valid through 5/1/2017. As you clean your car’s exterior is a perfect time to check for things that may be working loose such as license plates/frames; headlight and taillight lenses; mirrors; valve stem caps; hub caps and antennas. While washing the car, pop the hood and take a look inside the engine compartment. Look for loose wires; broken cable ties; you don’t want a wire hanging and getting snarled in the fan; loose connections on the battery; loose connections on the air cleaner cover, and so forth. Check to be sure there is no corrosion built up on the battery connections as well. Even in a large city, where all the natural dirt is pretty well paved over, there is still dirt and dust blowing around. The source, instead of Mother Nature’s dirt may be particulate matter from bus exhausts; construction debris; rubber dust from all the tires on the roads themselves, and so forth. These kinds of dirt are even stickier than “regular” dirt, and stick by themselves without the help of moisture. Add the moisture, and you have a very dirty car. That dirt is damaging to the finish. There are also run-ins with those rude birds who never like the color of any car, and try to re-paint it to their own tastes. Bird poo is highly acidic, and will etch the clear coat and paint. Get it off as soon as you notice it, even if it is not a regular wash day. Once the clear coat is damaged, the dirt and moisture are able to seep underneath, and begin to lift and destroy the clear from underneath. Once the clear coat is gone, there is nothing to protect the paint, which is the next thing to begin to be abraded by the action of dirt and wind which continue to scratch the paint. Once the paint is damaged, you’re down to the bare metal…and now the problems get worse. A scratch in the paint may be minor, but if it goes all the way through the paint, and exposes any metal at all, even if it’s too small to see with your naked eyes, that moisture and dirt now start working their devilment upon the metal. Regular washing along with other routine maintenance helps retain your car’s resale value. Well, if you are very lucky, and live in a fairly dry area, maybe not much. You might consider that you have a protective coat of mud instead of a clear coat. Ironically, the older the car, the more likely you may be to get away with this approach for a time However, the newer cars, with our modern emphasis on doing everything faster they have thinner coats of paint and thinner clear coats. Today’s cars are almost designed to be throwaway vehicles; as much as our corporations are dealing out planned obsolescence. They don’t expect people to keep a car for 10, 15 or 30 years as people used to do; they expect you to trade it in for the latest model. The paint jobs are made to match that expectation, so to keep your car looking shiny and new! 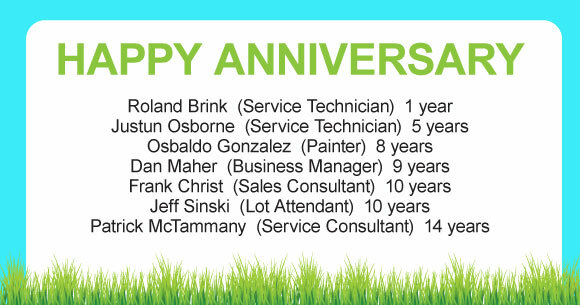 Call us today at 585-299-2695 or go to our Service Department page online!